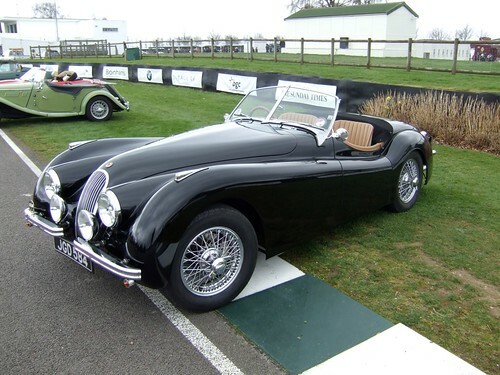 So I was stood by this lovely XK120 when a guy with his mates came up to look at the car. 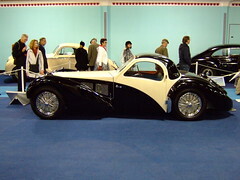 One said it was an XK140. 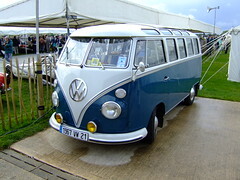 I turned and said that it’s a 120 – you can tell by the split screen and low swooping body work. His friend replied that it was most definitely a 140 – they too had split screens. I replied that I was unaware of that, and as far as I was concerned, this was a 120, as the sides had a very exaggerated sweep and along with the split screen, it was a 120. The other friend started looking over the car and said he also thought it was a 140…. 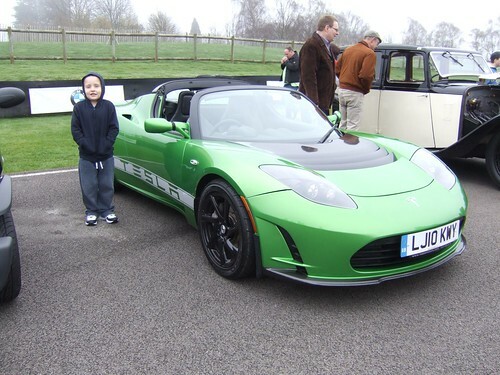 I wasn’t going to back down – after all, I was damn sure I was correct AND I had been telling Alex all about these cars… and daddy couldn’t bee seen to be wrong. As the three guys were saying how it must be a 140, Alex tugged my sleeve and pointed at something. I saw what Alex was pointing at, then mentioned it to the three guys, who muttered to themselves and left it at that. 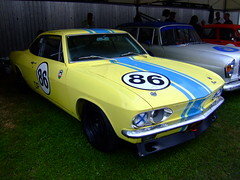 Another great breakfast club at Goodwood with some fantastic cars showing up on the track. 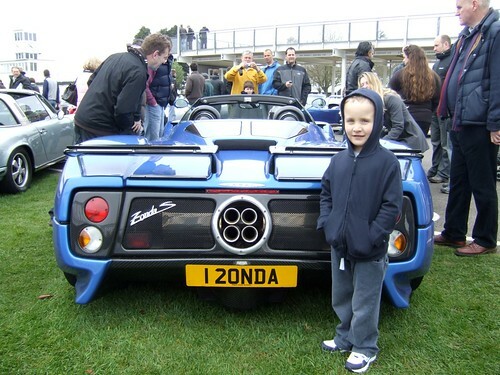 Everything from drop top Vauxhaul Cavaliers (yes… a few still around…) to the almighty Zonda S (Sportster). 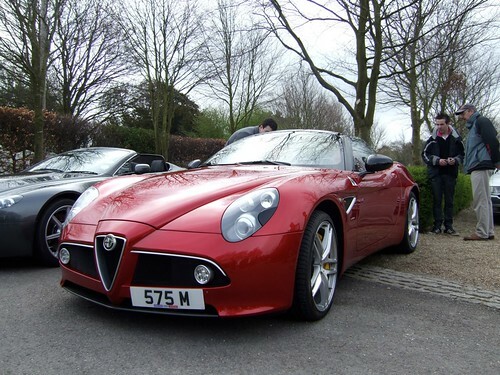 Some stunning Jaguars and beautiful Alfas – and a whole lot more. The most Tesla’s I’ve seen in one place too (3 of them – one on charge in the paddock). For more info on the Breakfast Cub, see HERE. 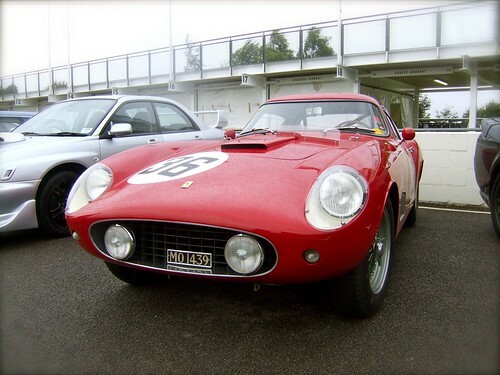 Rain and wind didn’t keep us from the October Breakfast Club at Goodwood. The amount of cars seemed lacking, most likely due to the weather, but there were still some pretty special motors to be seen. 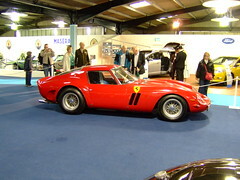 Top car had to be the Ferrari 250 GTO Tour de France, closely followed by a colleagues awesome (the only word that can describe it) Chrysler New Yorker. 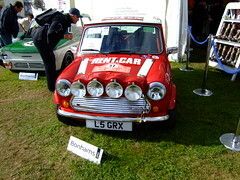 Alex Burns (Richards father) was there again, and I had an interesting chat with him about cars and my little lad. Whilst there I had a photo taking of me under the LUCAS sign board in pits. This is now my profile image in Facebook and Twitter – HOPEFULLY it’ll help the less than bright celebrity stalkers realise that I’m not THAT Lucas Black. 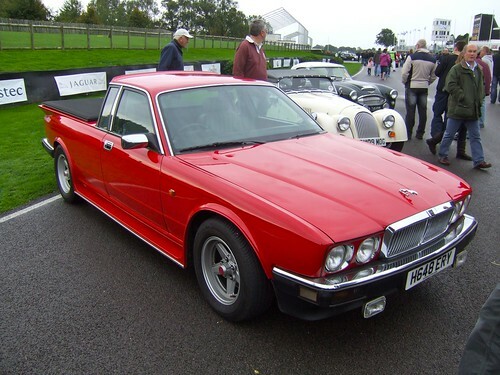 One of the cooler ‘odd’ cars was this Jaguar pick-up conversion, which sounded fantastic! Yes! It’s that time of year again! 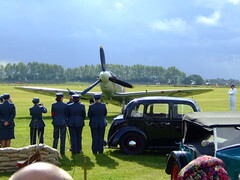 Ever since my father died I have made the Revival the event to remember him by (mainly due to the warbird air displays, but also due to the feel of the event – like a step back in time to ‘proper’ racing cars and drivers…). 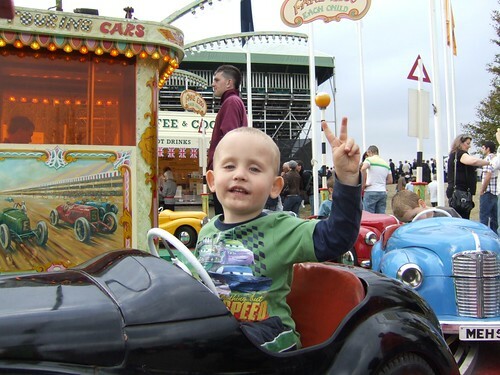 Alex loves the Revival too – after all it has lots of cars & bikes to see – both static and racing, interesting sideshows and a vintage funfair. We went on the Friday as his school had teacher training, and Friday is generally quieter due to people being at work/school. Less people means you can get closer to everything – even if the big races aren’t on. 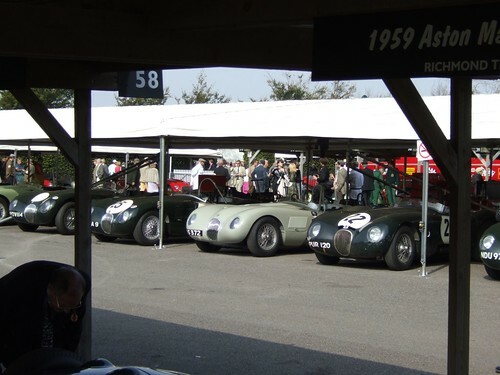 The cars still go on the track and give it everything they have to qualify, so the excitement of seeing multimillion pound historic rare racing cars being raced as they were designed to do is still fully there. This year we met up with friends (Phil and Martin Stenning). After buying my tickets I was offered a pair of courtesy tickets from my mother in law (timing! 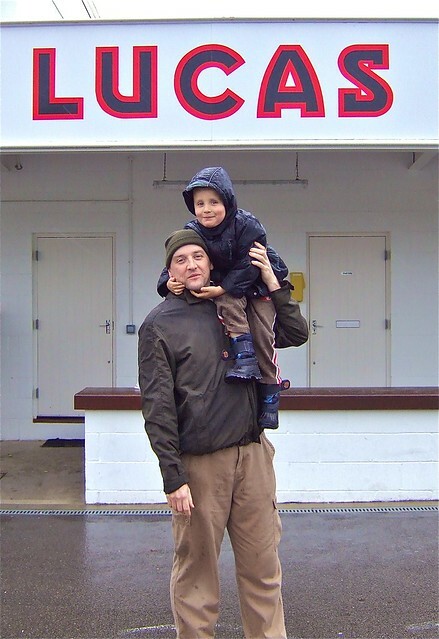 ), but as I knew Phil was about to depart on Irish adventures, I figured it would be a great thing to give him and his Dad the tickets for a day out and to catch up with the both of them – great chaps. 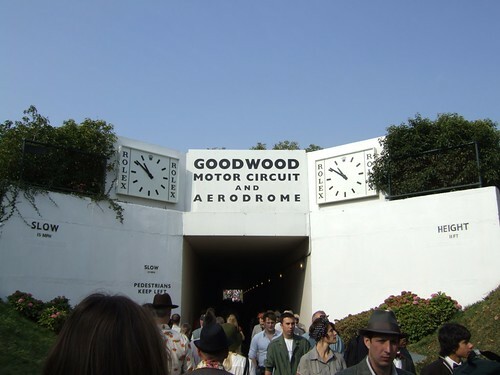 The weather was superb, the racing was great (plenty of spills and thrills), the air displays were low and tightly performed, the paddock areas had a great selection of the rarest racing cars around… and this all lead to a fantastic canvas with a most wonderful ‘automobilic’ soundtrack! I love my little lad! From the top of a ferris wheel (he’d never been on one until today) he spots a tiny yellow spec in the distance… “Look Daddy! 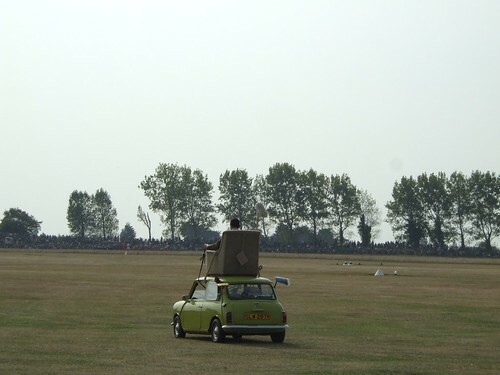 An old Fiat 500!”…. 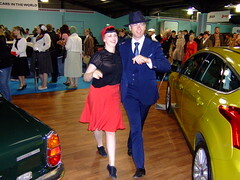 Shortly followed by him picking out a few Jaguars for me! In the weeks leading up to the Revival I had been having a brief email conversation with Chris Barrie (yes… that Chris Barrie, but he is much more than a guy with a tinfoil H stuck to his forehead). 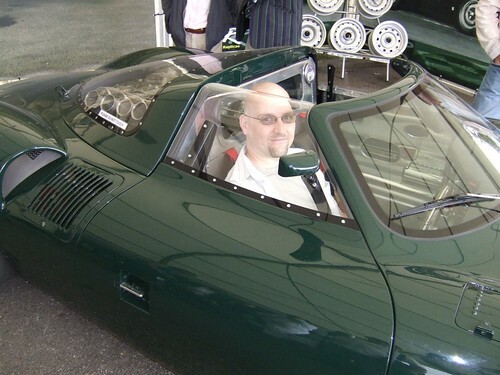 I had seen him on a motoring show on TV – Fifth Gear – he was given the chance to drive an original Jaguar D-Type racer, and that triggered me into looking for his contact details to just say how much I enjoyed the footage (some people can drive an exotic car and just kill the pleasure – but I felt the thrills from this presentation). 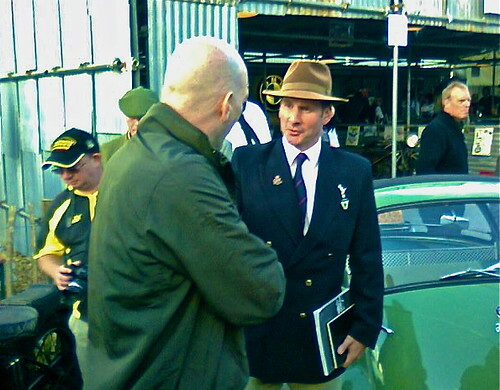 Anyway, we got to email chatting about Jaguars and the great event that is Goodwood and Alex’s love of cars. 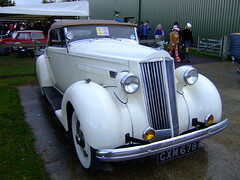 Chris said he has a tuned XK120 he was hoping to take down to Goodwood, so I was looking forward to that. As it happens he couldn’t take the XK120 as it was still undergoing work… and I found this out because as I walked around Goodwood I ended up bumping into him (pointed out by Phil!). 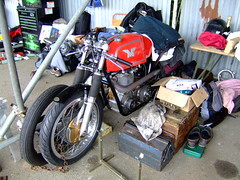 It was a bit of a bugger that it was in the motorcycle enclosure with the loudest damned Vincent racer warming up in the background, as it made it hard to have a conversation – but Chris was a thoroughly great guy and said to keep in touch (this may have been out of politeness – but even if it was just politeness, it shows him as a polite guy!). Before you ask, NO… I did not mention Massive Speed, Brittas Empire, Red Dwarf, Tomb Raider etc…. I’m sure he gets enough of that – I’ve always liked people into engineering/history and that’s what I was interested in (even though his TV/Film stuff is actually very good). He didn’t ask me about my work, so I wasn’t about to ask him about his! Put it this way – Loads of people have “done” TV and movies…. 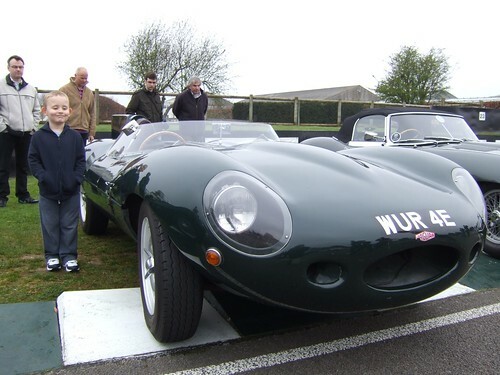 but not many people (a handful) had driven the 1955 D-Type Le Mans winner…. 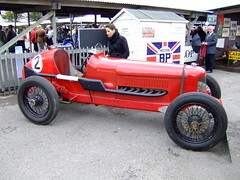 the car driven by Mike Hawthorn. 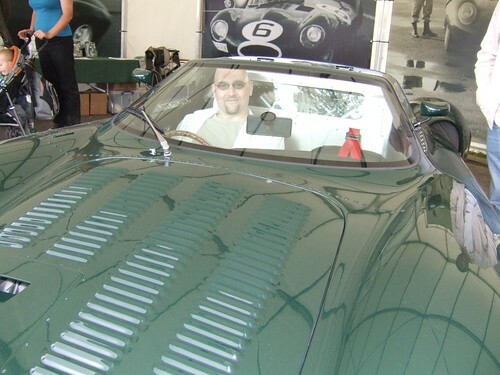 That’s what interested me – and the fact Chris really likes his cars. 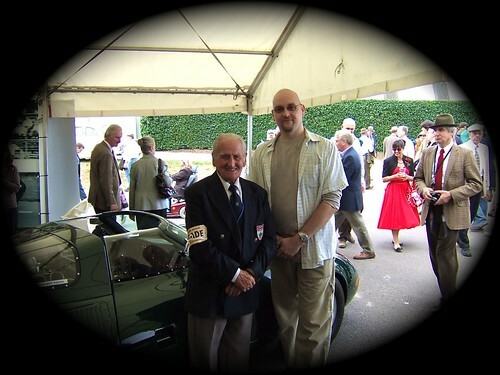 If you read this Chris, it was a real honour to meet a man who has driven in Mike Hawthorns D-Type (you are the second person I have met who has done this – I met Norman Dewis last year… what a guy!) – and I hope you get the XK on the road again soon! He wanted me to film him with his cars today – but it’s often tricky as he then becomes more interested in the camera than the cars! All he knows is all he has learnt from magazines, TV or asked me about (or other people). I don’t want to force him into anything as I don’t want to put him off cars – but when he does ask questions I don’t “child” the answer down. 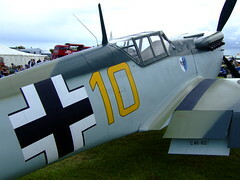 He wanted to know what the wings and spoilers were, so I told him about the aerodynamic aids cars have. He knows about engine layouts too – and not era of car is a problem for him! Something very sweet about the way he pronounces a lot of the car names too! 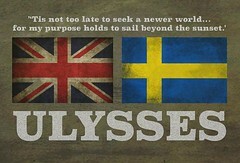 I’ve posted this before, but I like it so much I decided to share it again! 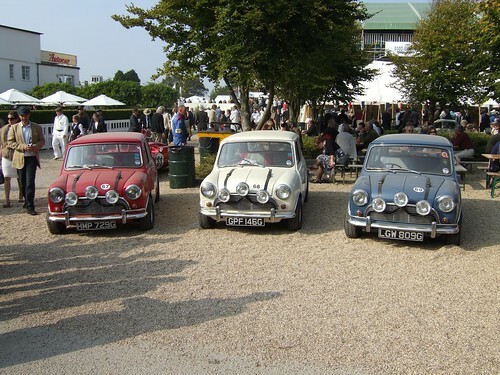 It shows Alex at one of the Goodwood Breakfast club meetings. He doesn’t just look at the cars, he asks about them. Who am I to starve him of the answers! 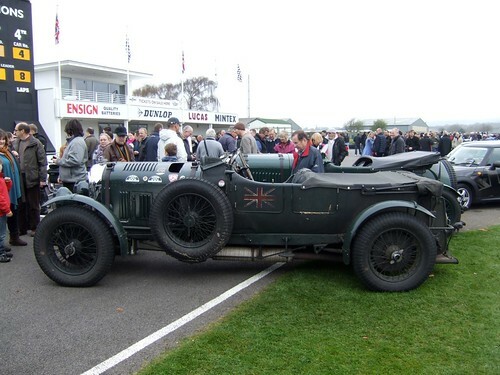 He knows his V8s from his straight 6’s, his dropheads and his tintops…. got to love him! ‘Scuse me whilst I kiss the sky!!! I’m still a bit overly happy! I’m sorry! 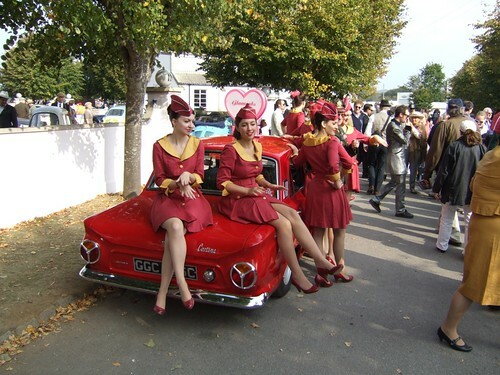 Goodwood Revival 2009 will go down in my history books as the day I reverted to being 9 years old…. 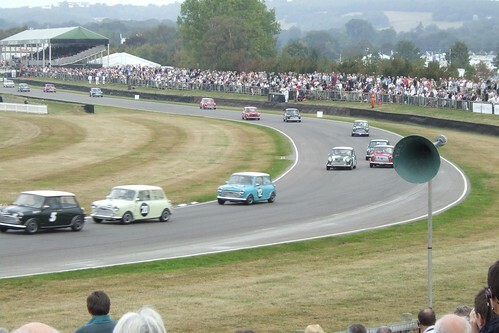 It’s always great – no two ways about it, the Revival is the greatest motorsport weekend there is. All the famous and not so famous race cars from the many years of track racing. 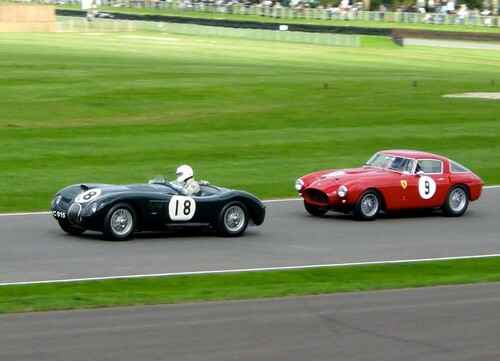 Jaguars, Ferraris, Mercedes, Alvis, Ford, Chevy, Lotus, I could go on….and on… all battling in very heated full pace battles. 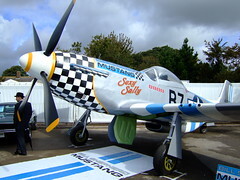 Not replicas – these are the real deal… 50 to 60 years old and they are still adding to their history. Why was this one different? Well, by now you will know of my love for the XJ13 – the most beautiful car in the World – FACT (Okay, opinion, but it should be fact). 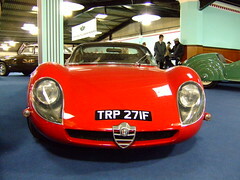 This 60’s supercar managed 206mph under the guidance of the great Norman Dewis. 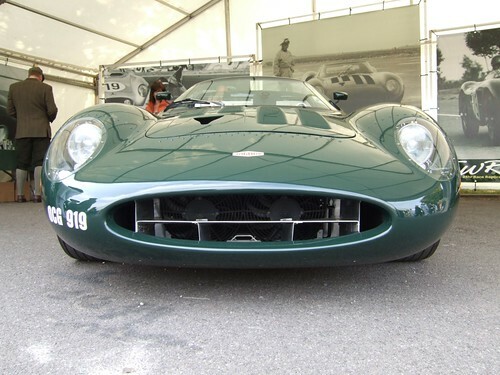 It was the 13th model for Jaguar, hence the XJ13 tag… a mystical number… some see it as unlucky…it just adds to the tale. 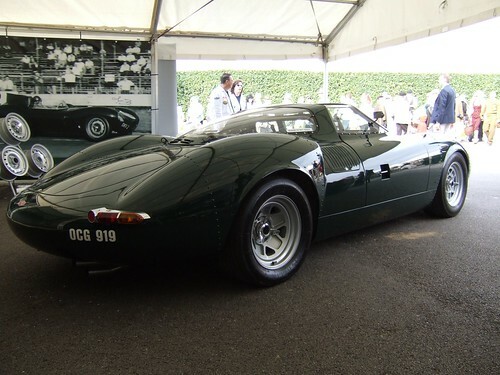 It was going to be a Le Mans entry to crush the Ford GT40’s and Ferraris of the day, but just before it was ready the race rules changed and the XJ13 wasn’t allowed to race. 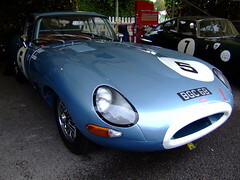 It was the test bed for the Jaguar V12 powerplant that went on to get fitted in later Jaguars – notably the E-Type. 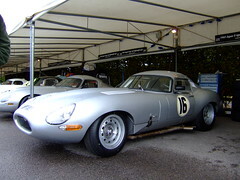 In fact to launch the E-Type a photo shoot was called up with the XJ13 to add heritage to the new V12 E-type. On this outing one of the magnesium wheels “let go” and Norman had an almighty crash. 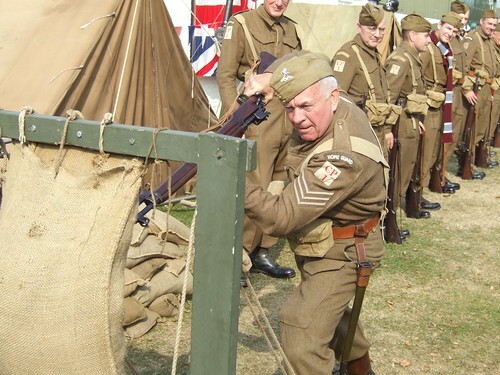 The car was all but written off – and luckily Norman survived! 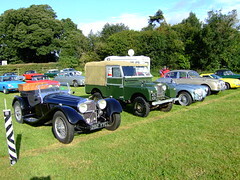 Years later it was rebuilt and is now with the Jaguar Daimler Heritage Trust Centre. 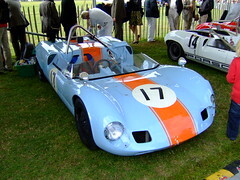 Named the thirteen…a still born racer that almost killed its test driver… a beautiful, powerful car that can still hold its own… those GT40’s got away lightly… the XJ13 would have eaten them alive. 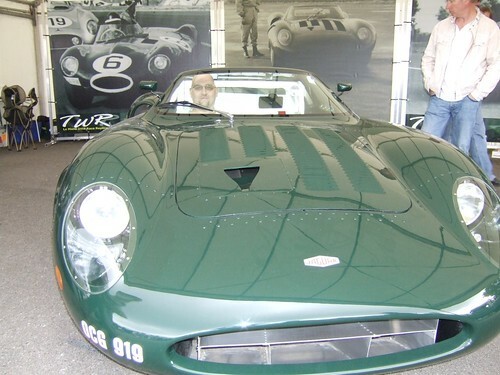 I first saw the XJ13 many years ago at Beauleau Motor Museum and fell in love with it. Since then, on odd occasions we bump into each other. 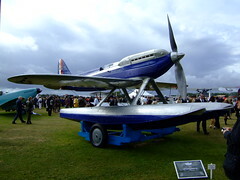 I eventually came to know of the TWR replica (Click here to link!) 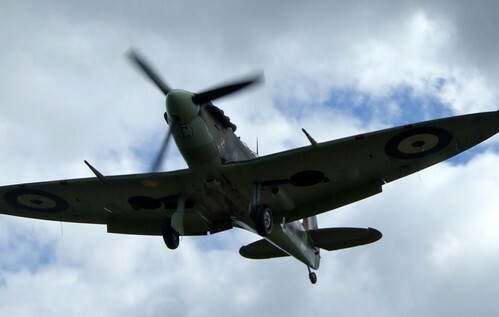 – the most accurate and faithful of the few replicas out there. At £105,000 it isn’t cheap – but then it is an XJ13…. It always stops me in my tracks, and today it did once more. 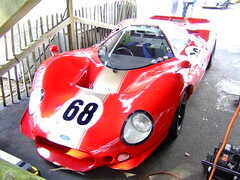 As I rounded the corner as we walked through the Revival event I saw the TWR XJ13 sat there…. 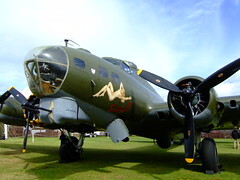 The engineer in charge of the project (Trevor – the T from TWR) was there and we got chatting about “her”. It was the first time I had got a chance to talk about the 13 with people actually involved. After a long chat with Trevor I went off and caught up with Chris and Alex, where we all then took in the sights, sounds and action of the Revival. We met old and new friends on our walk about, and generally had a good time of it all. 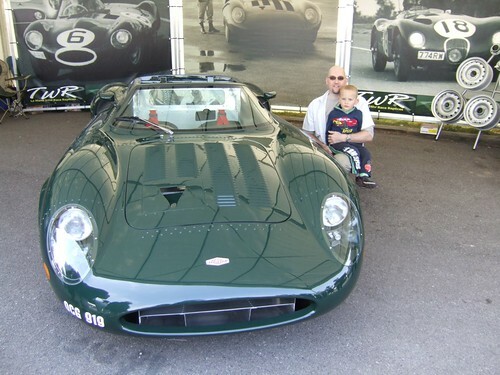 Toward the end of the day (and this blog entry) I met the XJ13 again…but until then…. 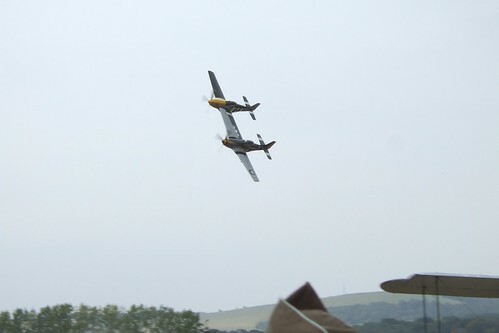 Spitfires, Messershmitt, Mustangs and a Vulcan took to the air, vintage racers blitzed the track… (Alex loved the Mini racing – which really was a nail bitter)… and we loved it. 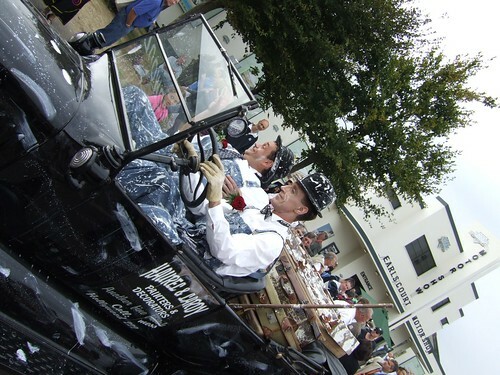 Fairground rides, Rockers, Dad’s Army, Laurel and Hardy, Hippies and Mods – static car displays the lot – Brilliant. We caught up with my Father in Law as well, which Alex had been on about all day (he loves his Grandad!). Always great to catch up with him – although on race days he is obviously under a lot of stress and pressure with his job! I never really expect to see much of him on those days – so if we do manage to meet up it is always an added treat. I went to take a photo of the two of them and the camera started to misbehave. 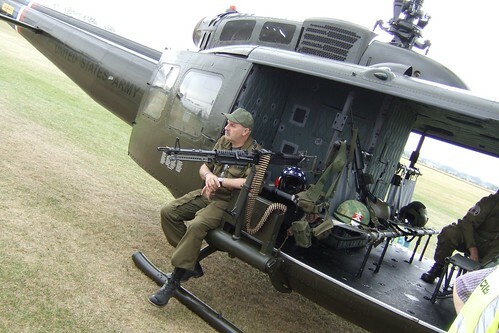 Norman suggested I was out of film…. I tried again to get a shot. 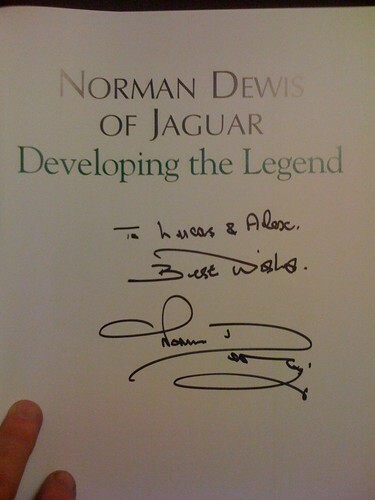 Thanks to the ice breaker I found myself talking to Norman Dewis… Trevor then suggested I bought the Norman Dewis book (a huge tome about his life and key role in developing the Jaguar cars from C types to XJ saloons, XK’s and XJ’s…. his racing against other giants like Moss and Fangio…). I’ve wanted it for a while…. It isn’t a cheap book, but it was 30% off for the Revival.. but still not cheap…. so I said I’d buy it as my Christmas present… as long as I could have a seat in the 13, and if Norman wouldn’t mind signing the book…..
Needless to say I ended up sat in the cockpit of the 13, with a signed book and several photo’s of me with Norman, the XJ13 and Alex, me and the 13…. I look a little mad in these pictures… but I was trying hard not to look too much like a kid in a candy shop! 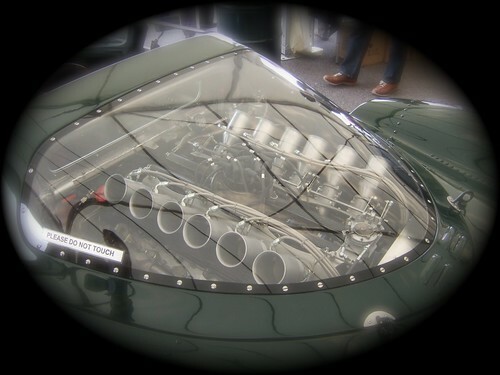 Behind my head… 450hp of V12 in a 1200kg chassis…. SWEEEEET! It was all over far too soon for my liking. As we wandered away I then spotted a golf cart heading towards me. It stopped… I recognised the driver and went over to shake hands and say “hello”….. Murray Walker! Yes, Mr Voice of Formula One himself! 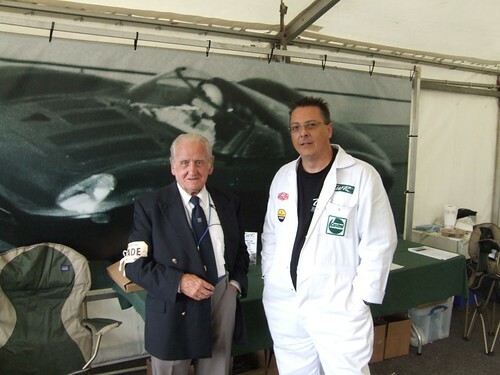 Murray Walker shook the hand that 1 minute earlier Norman Dewis and shaken… I may never wash it again! Two Legends! How can I better this? Well…. unless I can raise the finances, the next step would be a trip out in a 13… (or THE 13….*shudder! *)… Better still would be some wheel time in the 13…. but hey! 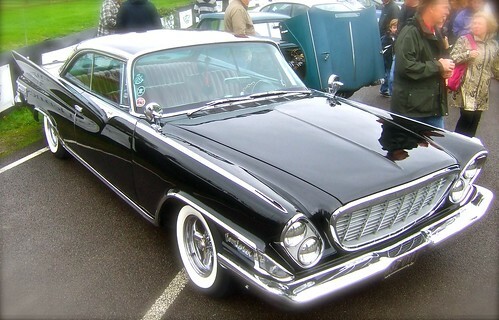 I’m still counting my lucky stars that I even managed to sit in this, one of the greatest cars to have ever existed. Bad Cars, Monster Bugs & Colour me Good! As I had to go shopping & visit the bank at the weekend, and Chris has some trips to take during the week, I hired a cheap car. It’s a Chevrolet Aveo, and it’s all wrong! Not too bad here either… just don’t touch! It looks okay inside and out (once you ignore the huge cheap plastic Chevrolet badge), but once you get tactile, the thing proves to be very cheap and flimsy. Thin plastic dashboard, body panels that pop in and out – but to look at, it’s not bad…. 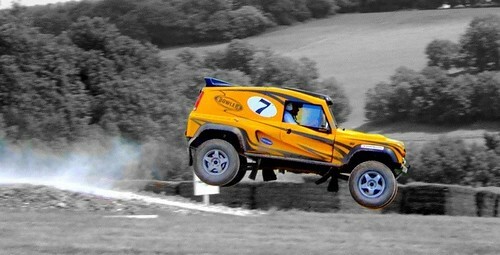 Once the engine starts and you pull away…. eventually…. you gain some speed…. 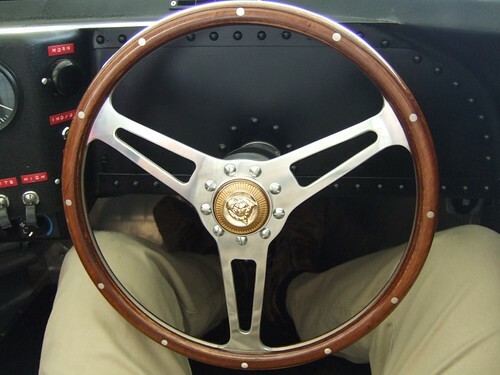 then you’ll have to steer…. It wallows and rolls from the lowest speeds and gets worse as you get faster. The steering is super light and the slightest turn of the wheel has the car turning as though it’s one of those bikes from Disney’s “Tron“! Trouble is, it feels like it’s about to fall over at any moment! It is actually scary! 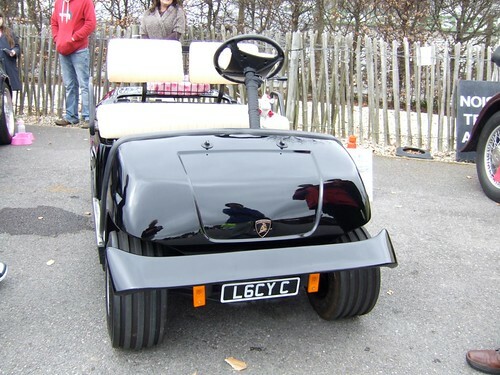 It’s a bit like a speed boat… It drives as though it is about to flip over and the steering is far too light! It’s so light the car needs constant adjusting to stay straight – Not great on a motorway! Worse still is the suspension! For all of that wallowing and threats to roll the car over at walking pace, you end up breaking your back if you hit pebbles or slight bumps in the road! How can the ride be so harsh when the handling is so soft and pathetic?! Fuel economy is great though…. So it looks alright, economy is great… ride is terrible and handling is more vague than a cornered politician. BUT…. 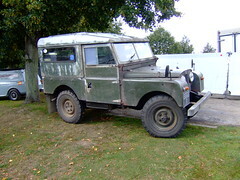 once it was parked in the Camberley car park things picked up! Well…. that’s because we had parked next to the most awesome of VW Beetles! Alex thought it was brilliant – A big Herbie! Big Racing Herbie!!! – and I think he was spot on! It was brilliant! 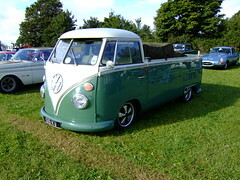 I’m not a great VW Bug fan, but this one looked fantastic! 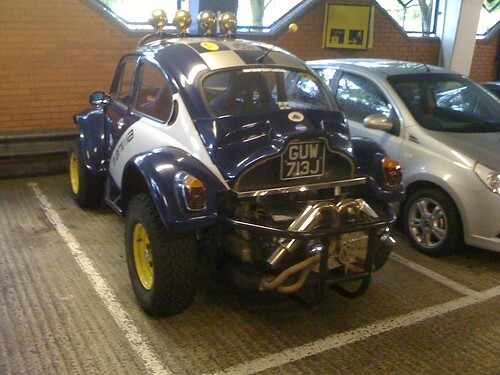 Thumbs up to the VW Baja Bug! I took the opportunity to use my iPhone photo adjustment applications. Due to the car park environment the Beetle didn’t really stand out – but some new software on the iPhone (ColorSplash and Photogene) produced some great shots! These two applications are great on the iPhone. I have had lots of success (well, I think I have!) adjusting various pictures I have taken… Here are a few more… or follow THIS LINK to see my Flickr page. I wanted to do something for my Father in Laws Birthday, and to thank him (from Alex) for a great day out at a Goodwood Breakfast Club. 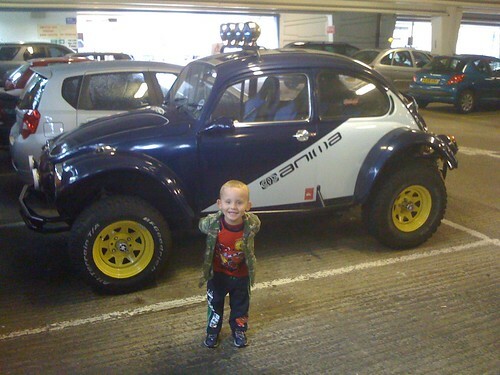 As you may all know, little Alex (3yrs old) knows his cars…. 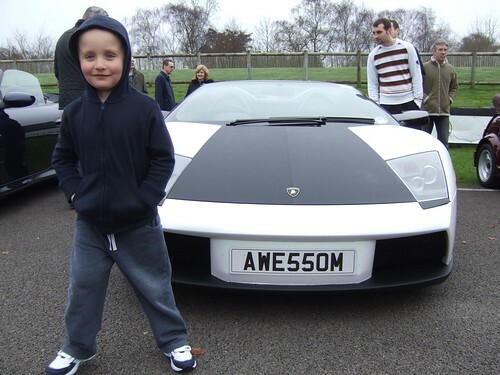 and I mean REALLY knows his cars…. 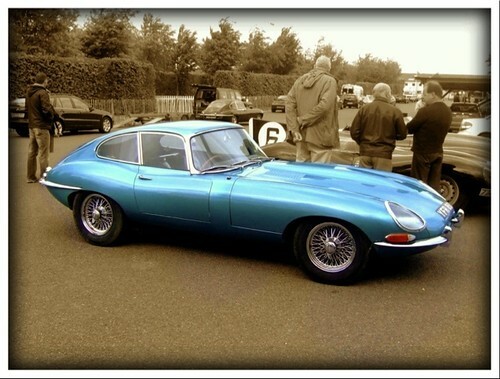 Ferraris, Jaguars, Pagini, Lamborghini…… Gumperts, Bently, Astons etc…. he has an uncanny ability at recognition! 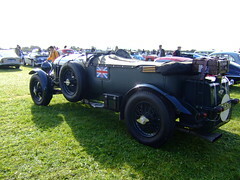 So, as a treat, and to see Ian (FiL) we went to a Goodwood Breakfast Club (PICS). 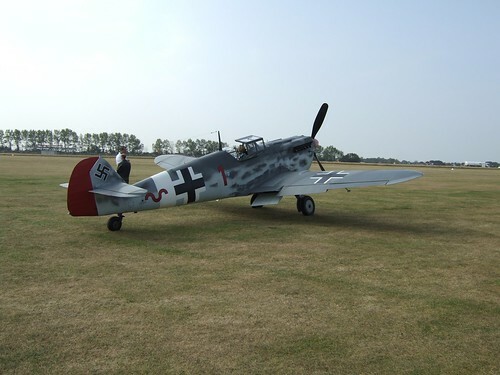 Admittedly my father in Law was working (as he is Senior Track Steward & Site Supervisor at the Goodwood Circuit), but he managed to share some time (and bacon sarnies) with us! What did I do then….. well…. 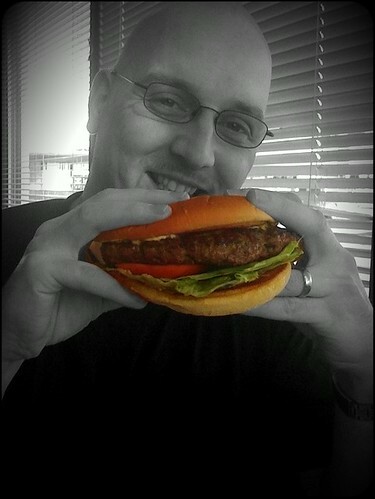 I rate the Mac pretty highly – It’s an easy machine to use (far easier than a PC…. and yet performs much better). My Macbook came with a program called “Garage Band” which is a music writing/edit suite. It’s fantastic! It allows me to take any of my music and turn it into ring tones (with a sample length does not breach copyright). It has inbuilt samples along with a huge array of instruments for original compositions… you can even plug in your own real instruments and vocals…… but the first thing I played with was the samples. They can be cut, re-arranged and mixed to make some pretty good stuff…. I’ve had a few people convinced it was a real recording, and not some computerised mix up I had produced! Anyway… Here’s the first track I wrote – mixing and cutting/splicing the Apple supplied samples. 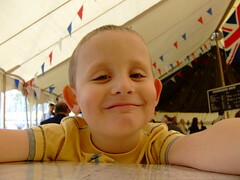 To make it a bit more interesting, I made it into a photo slide show of Alex at Goodwood for my Father in Laws birthday. Happy Birthday! Watch below or CLICK HERE!